Rebecca Holden is an artist based in Wellington, New Zealand. In 2013 she completed her MFA at Massey University in Wellington. Rebecca has exhibited nationally with solo and group shows. Recently she had her first international solo show. In addition to her arts practice Rebecca also teaches in the fields of drawing and painting. “My paintings, often large and gestural, employ visual narratives to explore the multiple guises of humanity. The good and the bad conditions of humankind act as agency to my practice. I utilise figuration and colour in the portrayal of emotion and gesture. 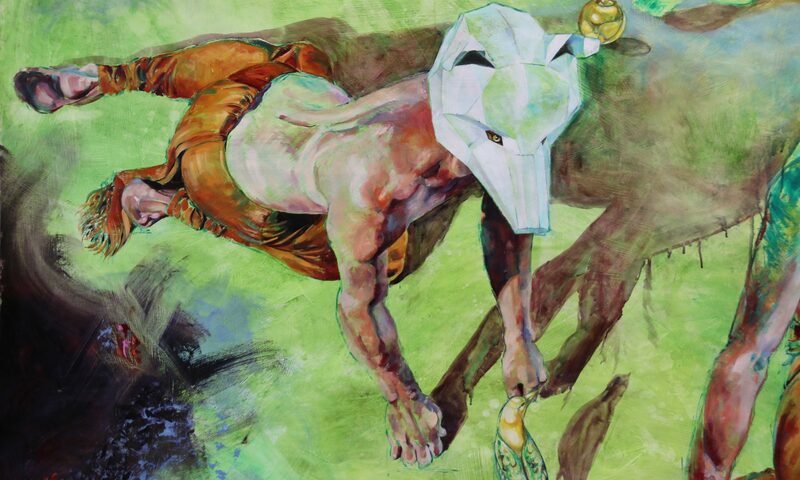 Representations of animals, a regular feature in my works, are interwoven into the composite arrangement of my paintings. The animals are often metaphors for different aspects of humanity. The perspective of distance, be it geographical or historical, also informs my work. In my paintings I utilise different levels of finish from sketched forms to layered, more highly rendered areas to give different levels of interest to areas of the work. Mistakes and corrections are left partially visible marking the progress of the works journey.